6 casual outfits that don't involve wearing jeans. Is it just me or do you catch yourself reaching for your trusty denims almost every time you're getting dressed? Don't get me wrong! I love my jeans but wearing jeans/denims everyday can get boring and there are so many things you can wear instead of your plain old jeans and still stay comfortable and look stylish! I'm all about stepping outside my comfort zone and I'm always willing to experiment. So, here are a few options you can try the next time you have to put together a casual outfit. I hope this can help you out if you're stuck in a denim rut like most people are. Jumpsuits are so under rated. They are so comfortable, stylish and my favourite part about jump suits is that you don't have to worry about matching the top and bottom together. You will look put-together instantly. Think of it this way : A jumpsuit is a onesie that you can wear outside! A jumpsuit, according to me is the perfect outfit to opt for on a casual day out, a movie or for a shopping day! However, you can find one to suit any occasion whether it's for work, for a party or a vacation. They are fuss free and so stylish. Personally, I love bright, single color jumpsuits. There's just something about it that catches the eye. I dare you to give it a try. You won't regret it. I promise you. Palazzos are the new jeans! Palazzo pants or wide leg pants are more comfortable than jeans. ( It's true). They aren't as basic as denims and they are definitely more fashionable. These pants are so fun to wear. If you've never worn palazzo pants before, I suggest you first buy a pair of black or blue ones. However, if you love colors like I do and are willing to go all out, you can wear any color or print. Check out this Tiffany blue pair. You can buy it here. 3. Paper bag waist pants. Yes, there are pants called 'Paper bag waist pants'. I was surprised when I first heard about it, too. These pants have a little extra fabric at the waist (almost like box pleats) that makes it perfect for belting. 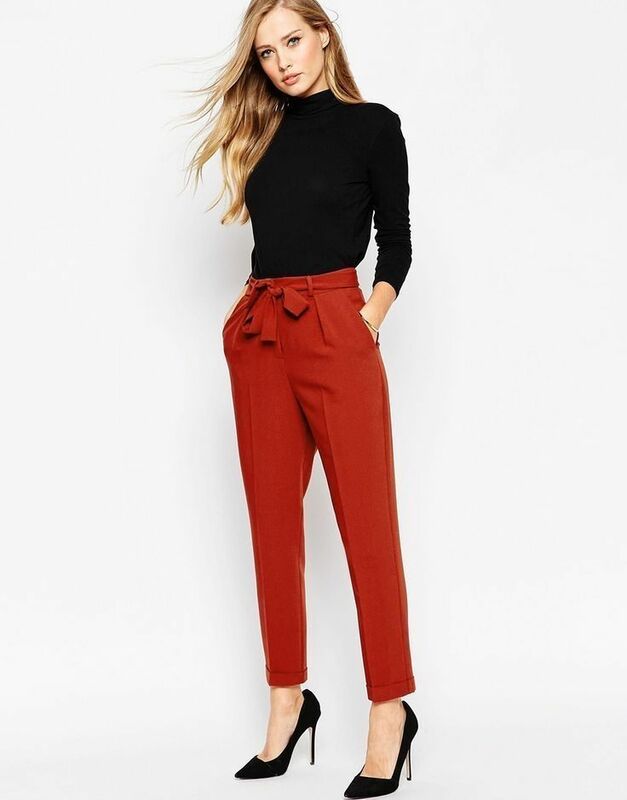 These kind of pants are usually high waisted and are very, very stylish and definitely more fashionable and cuter than jeans. These pants are so feminine and comfortable. Paper bag waist pants are in fashion now and the trend is definitely here to stay. 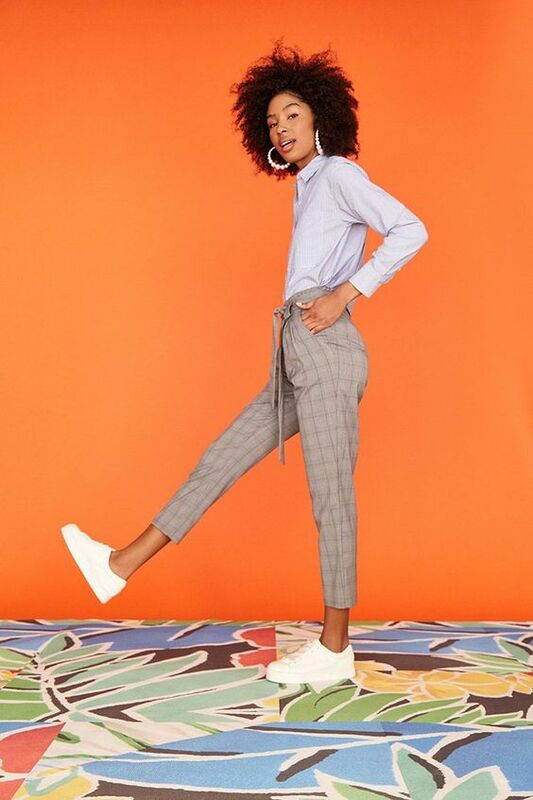 The best part about these pants are that, if you wear these pants with a shirt and a blazer it looks formal. But you can absolutely wear these pants with a crop top or a bralette for a fun look. I recently got myself a pair in baby pink and I can't stop wearing it. One of my favorite features about these pants is that it is high waisted. This makes your body look very flattering and makes your legs look longer. It also hides that little belly that you may have. So, what's not to love about these pants? Since these pants are a little baggy, unlike our skinny jeans, I suggest wearing the pants with a tight T-shirt. This is the best way to wear these pants, in my opinion. If you're too scared to try this look, I suggest you go for neutral color or opt for something with pin stripes for a formal look. Culottes are very similar to palazzo pants, except for the length. Palazzo pants are full length whereas culottes hit you a little below your knee. These pants are great to wear on a casual day out. They're breezy and comfortable and can even be worn as formals if you style it right. I personally love culottes that have stripes. These pants have been everywhere the past year and it's something that every body -type can carry off. You can wear it for any occasion and they're far better than your plain old jeans. The next time you're shopping, definitely try buying yourself a pair. You'll love it. I don't know why but I think of wearing a dress only when I have a special occasion to go to and I bet I'm not the only one. Dresses can be worn every day, just like how you'd wear your jeans every day. Dresses are a great choice because they are breezy and definitely more interesting than a 'denim and T shirt' look. There are so many different types of dresses to choose from and there's something for everybody. I've been obsessed with maxi dresses lately and I can't seem to get enough of them. The next time you're heading out, try wearing a shift dress or just a simple cotton dress and you'll definitely want to switch your jeans for a dress more often. Midi skirts are awesome. They're the perfect length for an every day wear. You can wear it to work and look stylish at the same time. The 'Midi skirt' that wasn't in fashion just a few years ago has made a comeback and you can see midi skirts being worn to work and to the red carpet. That's how versatile they are. My favourite kind of midi skirt at the moment is pleated midi skirts. You can see them being worn a lot. 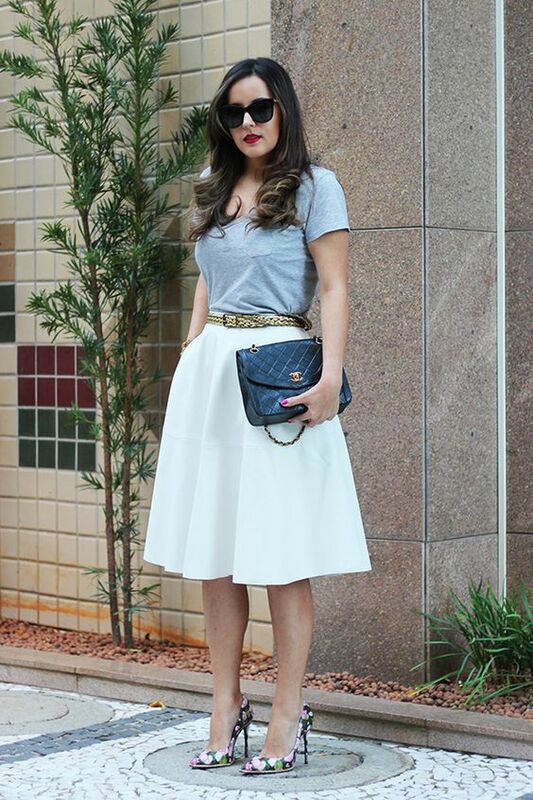 Another trend that I've noticed is metallic Midi skirts. If you want to buy a skirt like this, I suggest going for one that's flowy so you can pair it up with a tight T shirt or a blouse. Here are a few ways midi skirts are being worn in different ways by different people. So, the next time you go out shopping, please don't pick up another pair of jeans. Instead try wearing one of the above. You'll love it! If I missed something out, let me know in the comment section.